Two London previews of my Edinburgh show Say Sorry to the Lady coming up on Monday 13 July and Tuesday 14 July at Leicester Square Theatre Lounge (the downstairs bit) at 7pm. Tickets are £3 and you can reserve them HERE. I really want to pack these previews out so please do come and bring all your friends! Click on the 5* review from last week’s Edinburgh preview at The Stand. 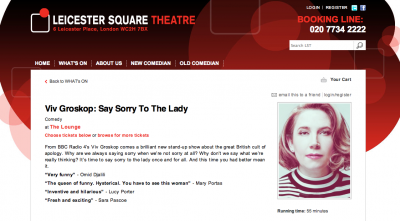 SAY SORRY TO THE LADY is all about the Great British cult of apology. Why do we say sorry when we don’t really mean it? Why don’t we say what we’re really thinking? And can it really be true that the average Brit apologises – according to one survey — 1.9 million times in their life. In a show based on her experiences as a parent, daughter, feminist, self-consciously middle class person and reformed serial apologiser, Viv Groskop argues that enough is enough: it’s time to say sorry to the lady once and for all. And this time you had better mean it. “Viv is brilliant” – Jo Brand. “My favourite new act” – Lucy Porter. “Fresh and exciting” – Sara Pascoe.